Lieutenant Governor Dan Patrick is a principled conservative who stands up for the people of Texas. Unwavering in his fight for life and liberty, Lieutenant Governor Patrick has presided over what have been called the most conservative and productive sessions of the State Senate in Texas history. 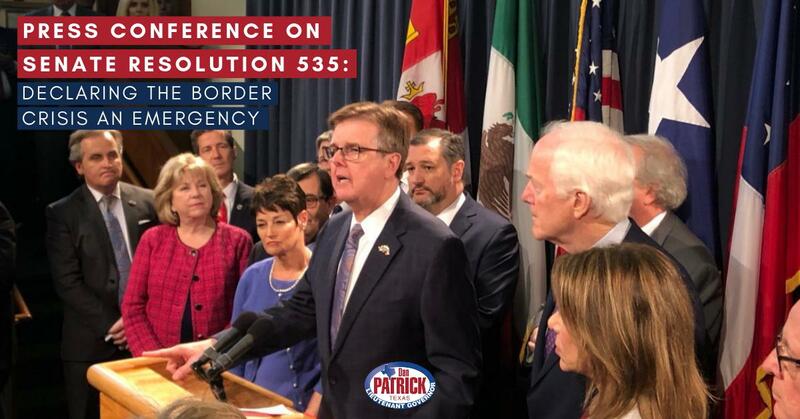 Under his leadership, the Texas Senate has dramatically increased funding for border security, ended sanctuary cities, enhanced pro-life protections, and protected religious freedoms. A preeminent voice for conservative principles both in Texas and across the nation, Lieutenant Governor Patrick does not back down in the face of liberal opposition. Dan Patrick is committed to continuing the fight for the people of Texas. He won re-election in 2018. Very sad to hear this. She will be greatly missed. Truly sad and blessings to her family. But, Dan, I have to ask - would offer the same olive branch for someone of her stature that resides on the other side of the aisle? What you do/say for one Texan, you should do/say for ALL Texans. I was just shocked when I heard the news. Had that lovely lady been ill? She was so young as my Dad was 41 and a dear friend Captain Shaw at 47. It is not fair. Prayers for the family. May you rest in peace. Did she know the Clintons? SO SORRY FOR YOUR LOSS, such a young age, God Bless U and may she R.I.P. Don’t let Bush move the cenotaph!!!!!!!! Weird how you've never declared it an emergency till the orange menace came along. I think you mean declaring it a "political tool." Some emergency. It hasn’t kept Trump off the golf course. By god does ignorance run in the republican party? We as taxpayers and constituents don't care about your made up shannanigans. We need actual legislation that focuses in real issues. Property taxes, education, roads, funding for police, fire, and yes actual inmigration agents not this folishness. Focus man FOCUS! If it’s such an emergency, why didn’t the Republicans do something when they held both houses? Obviously there’s no emergency. Patrick, Cruz, and Cornyn all in one picture. Seeing this, I suddenly realize that Larry, Moe, and Curly were amateurs compared to these stooges. I agree. Armed civilians kidnapping people under threat of lethal force and detaining them forcefully is absolutely an emergency. It’s definitely an emergency! Time to finish the wall and bring in the military to help border patrol. Such an emergency you’re spending your time protecting the religious liberties of chicken sandwiches? Mmkay. An emergency of your party's creation. If they didn't reduce the number of personnel, they could process the asylum seekers in a timely manner. But that doesn't fit your narrative of an 'invasion'. You fear mongering old coot. Keep clutching those pearls. Dan Patrick is such a mess! He doesn’t know which end is up! Current administration has created this crisis. But toe the line sir. Wouldn’t want to upset the authoritarian regime’s policy on racism now would we? But you support SB 17, so you’re like that . Let’s quite talking and do something. Dan action speaks louder than words anyone can give a speech. End frivolous asylum claims for a year!! Stop giving away free , health, housing, education .. fraud with SS , this system is so weak .. ridiculous!! Go get em Mr. Patrick!! We got your back!!! The majority of Texans arnt liberals with our heads in the sand thinking/ blaming an obvious major issue on everything and everyone else!!! We Texans see the problems first hand!!! Oh goody; now the border crisis is officially a crisis at the Texas border. NOW what good does that do? How will this official emergency crisis be resolved? Snowflake demands a safe space, news at 11. YOU are the reason they went up so much!! I cannot believe all of the ignorance on here!! YOU are the one who’s budget depended on a 14% increase!!! Y’all need to educate yourselves. DAN PATRICK WILL NOT HELP YOU!!! He is the reason your taxes are out of control!!! End property tax. Only 60% pay it. Do a 6% add on sales tax, everyone pays just not property owners. Rent can't cover all the taxes and insurance. When taxes taxes take 6k and insurance 2.5k. You would need 2200 a month to rent a 200k house in Killeen. You can't so you take a huge loss and most don't buy 200k. 6% sales tax add on would here in Coryell County more the replace school and property taxes. Sales tax is user based and fair to all. My property tax due went up 13% this year, a total of $1000. Waiting on you to post a video of why you provide better insurance for yourself and the legislature than you do for retired education personnel! We need an amendment to the Texas constitution to forever end property taxes on a homestead. And we MUST have a cap on the amount local and county entities can tax individuals. We're having too many bond issues passed - which are voted in by those who pay little or nothing in taxes. Please help us, Dan! Protect Texas from tax, tax, tax, tax, tax, tax. Not good enough. Sales Tax should NOT be increased and county appraisals have to be capped and not arbitraarily changed. No increases for seniors for school taxes as well as MUDD taxes; athey should be frozen at the valuation rate of when the property was purchased. Need to remove the property tax all together! It goes against founding principles of our nation, as you can never truly own your real property. You just have to rent it from the government. A poor attempt at tax reform. If you’d stop giving corporations Hugh tax cuts, we could all benefit. It’s an ineffective bill parading around as real change. And it ain’t that. So cap the growth of cities but you really aren't providing any sort of real property tax relief. This is just lip service to make it look like you are trying to help. Come up with a better plan and maybe find ways for business to pay their fair share of taxes. Pass cbd ..I have lupus..and it helps. Better than any script. Welllll...you need to get to Kaufman County because our appraisal district just set our values up over 100% !!!! 🤯 These are our homes !!! Taxes keep going up and nobody seems to know how to contain spending. When the schools think they have to pay for everyone's meals, have ESL for illegals and on an on. Schoold districts with nearly a billion dollar bond every few years for these monuments they call schools.This is BS. 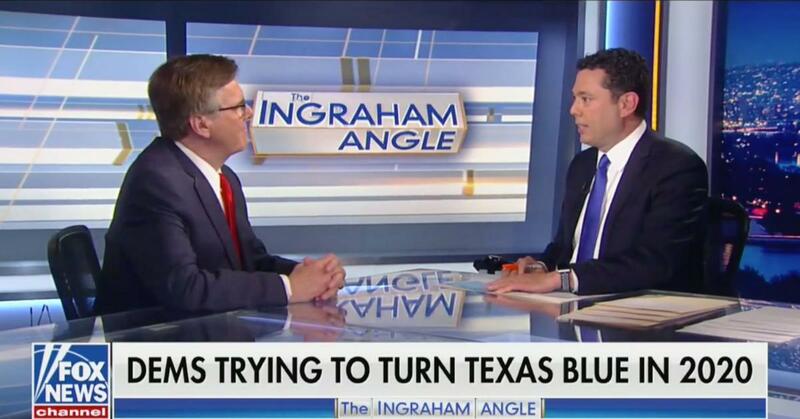 You don't have to nuclear bomb more waters of four other states to have people move to Texas the Ingraham way. 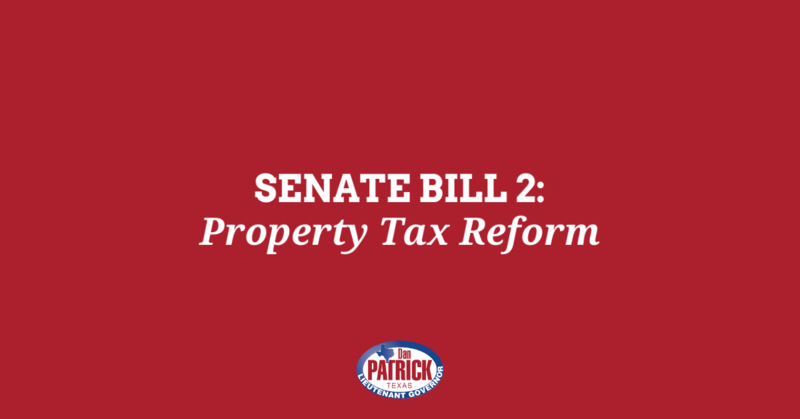 The 3 bills pertaining to our property tax burden are still waiting to be voted on, so it looks like nothing will be done again. There is too much graft and corruption in government and also the school system. The burden/ budget is over 60 billion dollars and Texas schools ranks less than 40% in the nation. Unacceptable. People get involved with your local municipalities and school boards to demand transparency and financial information. ur politicians are attacking the wrong part of this problem. They should be reducing the cost of government, not increasing taxes! People who move to Texas know that this state doesn't have the same ways as California and others. We want to keep it this way. The successful way. Texas can become California or New York! Is that what you want? Certainly not what I want! I had to move to Kansas from Texas. Texan my whole life, please keep Texas Red. I snorted my drink through my nose when I read that. Oh, the horror! You mean the OTHER party here in Texas might dare to exercise their rights as Texans and vote against the Republican Party because they don't like the direction Texas is going?! Good God! Did he just call Donald Trump "a Trusted member of the family"? You won the last election by less than 5%. Texas is purple. You might want to remember that. So what happened to Laura Ingraham? Did the new liberal ownership of FOX News have a problem with her telling it like it really is????? She wasn't on 4/23/19 either. Ya'll trying to shut her up? Don’t let them ruin our state! Vote Red so we don’t end up like California!!! Two right wing radio hosts pretending to talk politics. I keep this on my feed to see what is happening in the state, but all I see are FOX news interviews. Dan, please try to advance our Constitutional Carry legislation, keep our oil and gas flowing and build the darn wall! Did y’all talk about ways to stop windmill noise from causing cancer? Not here in Texas! We have more sense than that! We are not Socialist nor Globalist! We are Texans, we love our country, our God, our guns and our Mommas! The difference has never been clearer between the two parties~ continue to MAGA! I honestly doubt if there's two communicating brain cells between the two of them. You spend a lot of time on the most racist show on the racist channel. Good job Dan! Keep up the good work. And we are working to keep it Red! Dan Patrick, I'm glad you got on the show, and Jason Chaffetz too. But where is Laura Ingraham. I/you/we need to hear what she has to say. Bullying Conservative Republicans cannot be allowed, it's happening everywhere. NOT IN TEXAS, I pray to God. God with Your intervention that won’t happen. Please don’t let satan have Texas. Being a red state hasn’t helped Texans very much-just helps corporations and industries moving in from out of state. Fund our public schools, lower property tax in effective measures-not the2.5% cap and restore funding for county operations. Once that’s been corrected move on to returning individual rights to competitive pricing in healthcare and insurance. Then let’s talk about how to serve the fragile populations like poor children, the mentally ill, seniors, etc. You haven’t spent any time in improving the quality of life for ALL Texans. Dan, please pay attention to the comments from folks with the constituent badges, that will give you better insights to how Texans are thinking right now. Enhances voting integrity or disenfranchises those likely to vote against you? Why not vote to make election day a state holiday to encourage voter turnout? Voter fraud? What about election fraud? What we saw in the last couple of elections points WAY more towards election fraud and mostly on the GOP side. What about that? Good. It was quite obvious that in 208 there was massive voter fraud by Democrats across Texas. My biggest fear is that I will start voting democrat after I die! I urge you to pass the bill including solid waste workers in the slow down move over law. Sir, I'm tired of having to investigate collisions and injuries involving solid waste workers who were just there to collect people's trash! They don't make much money. When they are injured because of a careless driver it adds a burden to City and private companies impacting not only our economy but also the lives of those injured...including their families. Sir, if you'd like a look, please let me know. the idea is to make citizens so fearful of making a jail-time mistake that they won't vote. If the people don't vote, Republicans win. What are you going to do about Russian hacking? Does it hold social media accountable when foreign agents share false information via Facebook? Why is voting straight party taken off ballots starting 2020? Not fair I study plenty and I see The Democrats contestants want what We dont So I will vote republican hopefully they won’t take politicL party preference: off ballot. THAT WAY YOU KNOW YOUR CANDIDATE AND WHO YOU ARE VOTING TO REPRESENT YOU AND YOUR BELIEFS!! That's a lot of words to say "Keep The Darkies From Voting" there Danny. Republicans protecting democrasy Ha that's a good one! You've got me spitting coffee. This is your voter suppression bill, just say it. That's good. I have to prove who I am, show a voter card, and can only vote in my registered district. So the question is. Who messed up and failed to check these items last time or the next time. Voter fraud is an important issue, I guess. Election fraud is rampant, though, and actually changes election results. Why is so little attention paid to election fraud, Dan? well that’s real good news the way California and New York has pumped money down for that cross dressing criminal beto. something had to be done. Texas is red state like forever. If we require ID to vote we should put offices accessible by bus and enough staff that a 2 or 3 hour wait is not necessary. In the cities that is the norm. We should make every effort to insure all qualified voters can vote. Against Russian hacking? No? Then WHAT THE F ARE YOU DOING!!!! No problem! Every time I fly, cannot get through the airport without showing photo ID. President raises money at Argyle and then goes to Crosby, where he signs orders to speed pipeline construction. Good thing he's boosting oil and coal. We need to ban these cancer filled windmills. Because in a time when we know for a fact that fossil fuels are killing the planet, oil needs a boost. Fossil fuels are needed in the world and not killing the planet. Cutting down all the trees in this nation is killing the planet and the ozone. Texas oil never needed help before , why act like it now ? Pretty sure he just handed Texas a death sentence for the eco system. Poisoning the air wasn't enough, now he wants to poison the water and the food. Everything Trump touches dies. Doesn’t he want coal to come back? Oil doesn't need a boost..lower and middle class wage earners need a boost!! Yes, a price boost at the gas pump. So this is why gasoline went up $0.20 overnight??? You mean your lobby boost. Did he come to see our wall?! Dear Lt. Governor Patrick, Please legalize Casino/Sports Gambling in Texas. Oh, I thought it was to check out our ongoing border crisis that’s a “national emergency”.